•et; Tomorrow, (Saturday) Grains and Village Greens will be doing their 'usual' outside the Pack Horse, 10-12.00p.m. Grains Bakehouse will be bringing, in addition to their usual offerings, seeded sourdough and wholemeal sourdough rolls, olive and rosemary fruit loaves, and Danish pastries for 'treats'. Village Greens, who were delighted how quickly their very early season rhubarb went last week, will be bringing some more, plus cheeses and, of course, their £5 veg bags and £5 fruit bags too. Delicious! See you there...! •et; Tempted, confused or just wanting to know more about Nest, Hive, remote control service and security systems for your home? 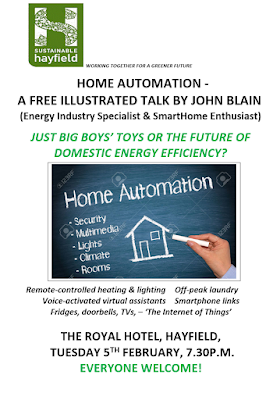 Come along to our free illustrated talk next Tuesday (Feb 5th) at the Royal Hotel, 7.30p.m., when John Blain will be introducing us to the potential of home automation for saving hundreds of pounds a year in energy costs, having heating, lighting, laundry and other services on only when you want/need them and having control of these when you're away from home. Increasingly, we're being encouraged to make our homes 'smart', and there are real financial gains in doing so. But what's the overall picture, what should we look out for, what downsides might there be? 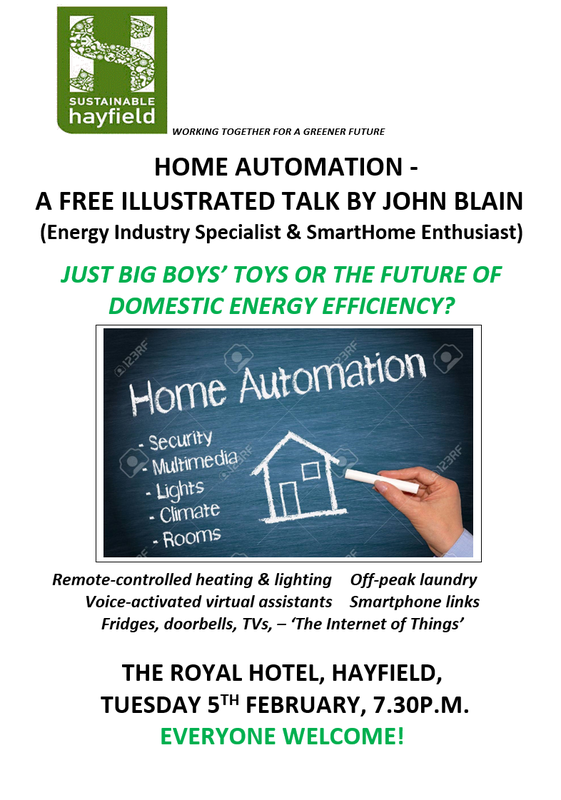 John Blain, an energy specialist, will be sharing his personal and professional experience with us in a quirkily titled talk 'Home Automation - Just Big Boys' Toys or The Future of Domestic Energy Efficiency?' It should be an informative and interesting evening. You've maybe seen posters around the village - here's your own, as a reminder!